1. Barth understood the early Przywara's analogia entis correctly, and rejected it. Barth never altered his rejection of that analogy of being. 2. The mature Barth, however, did develop his own analogia entis, it's just not Przywara's. In Barth's words: "I no longer turn up my nose as I did thirty years ago and say, 'Huh, metaphysics! Terrible!' Instead, I say, 'Let us talk further... We want to understand one another; we do not want to fight about words. Therefore I have now discontinued the battle against the idol of the analogia entis. I no longer fire along this front." 3. Przywara, on the other hand, didn't stand still either. His early analogia entis, which Barth consistently rejected, developed as well, as did Hans Urs von Balthasar's - thanks to Barth! 4. The shift in both Catholic and Protestant participants in the twentieth century analogia entis debate occurred because of, not in spite of, the discussion. "These theologians are who they are precisely because they interacted with one another, and none of them would have come to the conclusions that they did apart from this interaction." In his mature theology, Barth adopts an analogical understanding of God-world relation that leads to continuity between God's act in creation and justification, but this analogy works in reverse from the Roman Catholic one: the human as created stands in continuity with the human in grace precisely because justification is the condition of the possibility creation. 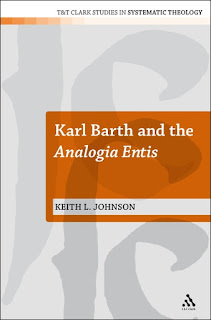 To be sure, the actualistic Barthian analogia entis may be insufficient for my taste, but at least Barth saw the need to develop one. Interestingly, this coincides with a recent SJT article on the subject by Timothy Furry entitled Analogous analogies? Thomas Aquinas and Karl Barth, not to mention the Analogy of Being volume which is now available. Unfortunately, however, Johnson's work doesn't seem to have penetrated the book as much as one might have hoped. In other words, White's The Analogy of Being: Invention of the Antichrist or Wisdom of God cannot be read apart from Johnson's Karl Barth and the Analogia Entis. Differences among the multiple theories of analogy remain, but the upshot may be this: Roman Catholicism, Eastern Orthodoxy, Radical Orthodoxy (which shrewdly steals the birthright of the former two), and even the mature Barth (however cautiously) curiously converge in an attempt to combat the atmosphere of modernity by restoring the analogy of being in some form, an attempt which dovetails nicely with Charles Taylor & Co.'s framing of secularism as an object of study and critique. Those of us raised on that secularism's manna - advertisements - can only express this widening demand for retropatristic, neomedieval, metaphysical robustness by recalling a spaghetti sauce commercial, where an uncompromising chef, dissatisfied with sub-standard sauce, repeatedly insists with a campy, guttural bawl, "Not thick enough!"